Burmese python (Python molurus bivittatus) is a very large python native to southern Asia, and common in the US pet trade. HABITAT: Found from India to lower China, the Malay Peninsula and on some islands of the East Indies. Lives near water and is semi-aquatic. DESCRPTION: Bold color pattern mainly in browns and yellows. Grows to a length of 20 feet and can weigh as much as 200 pounds. Maximum recorded length is 25 feet. Females are larger than males. DIET: Small mammals, birds, reptiles, frogs and even fish. Kills by constriction in which the prey is suffocated. Nocturnal hunter, it prowls looking for prey or waits by a water hole. PROBLEMS: Pythons consume large amounts of food, due to their size, and require large, often custom-built, enclosures, which can be very expensive. These snakes will attempt to hunt and as pets, this means that they will attempt to get out of their cages. 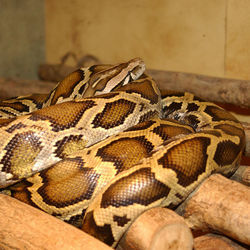 This species has a reputation of being gentle, tractable, and attractive but its sheer size and power make it an unsuitable choice for beginning snake keepers. It is capable of inflicting severe bites or killing a keeper by constriction. Due to the difficulties of raising these as pets, some owners have released them into the wild. This has caused wide spread concern as they occupy a place at the top of the food chain.